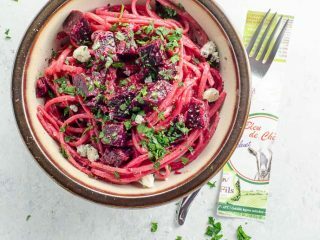 This gorgeous pink pasta dish feels special, but it's nice and easy to put together. 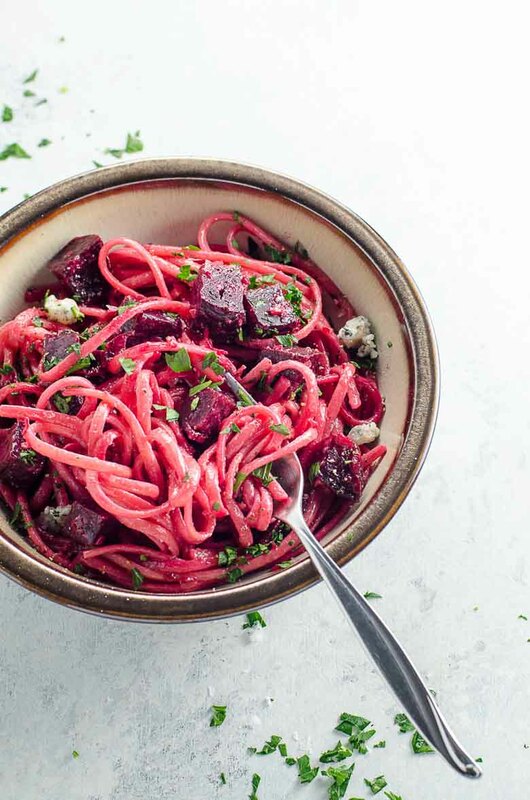 If you roast the beets in advance (or buy roasted beets), linguine with beets and blue cheese will be ready in less than 20 minutes. Big thanks to Goat Cheeses of France for sponsoring this post, and thanks to you for supporting our partners. 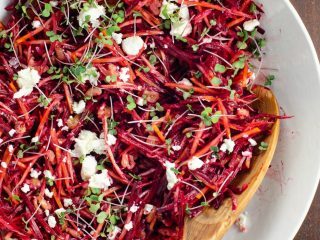 If you roast the beets in advance or buy them roasted, this meal is ready in 20 minutes. You can swap in fresh goat cheese or a cow's milk blue cheese such as gorgonzola dolce if you like. Good morning from the middle of a mild and pleasant post-Thanksgiving coma. That was fun, wasn’t it? Fun and exhausting and slightly infuriating, and all the things that holidays will be. Today we’re taking a nice little break from all that to focus on France. I figured we’d go somewhere that doesn’t even have Thanksgiving, just to be safe. Do you know what they do have in France, though? French goat cheeses. Beautiful, high-quality, but totally accessible and affordable French goat cheeses. France is the number one producer of goat’s milk cheeses in the world, with 6,000 goat’s milk producers, half of whom make their own cheese. With production in multiple regions south of the Loire Valley, there’s wide variety among tastes and styles. I thought I knew my way around chèvre reasonably well, but working with Goat Cheeses of France has introduced me to some new varieties, including the Bleu de Chèvre that I’ve used in the easy but special-feeling recipe below. French goat cheeses in their multitudes work well all year round, but at this time of year it’s nice to focus on cozy dishes that are dinner-party ready without too much time or effort. Bleu de Chèvre would make a great addition to a simple (or wildly ostentatious) cheese board and really needs no special treatment. But I couldn’t shake the idea of how its gentle piquancy might enhance an earthy and festive-looking pasta sauce made with beets. The resulting Bleu de Chèvre and Beet Linguine was very popular, and I’m looking forward to making it again. In the meantime, we’re off on a little hike to make some room. For lots more great ideas, follow Goat Cheeses of France on Facebook and Instagram. 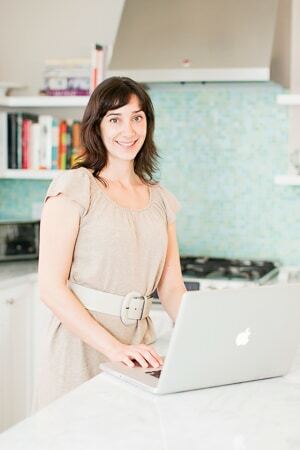 I love that the goat in their logo has that casual-chic French lady thing going on, even though she’s just a few lines on the page. How do they all know how to do that? Apparently you don’t even have to be human — or sentient — to have that skill. Maybe eating more French goat cheese is the key. Let’s try it and see how it goes. The combination of beets and blue cheese makes a luscious and beautifully colored sauce. This meal feels special but is nice and easy to put together. Melt and lightly brown the butter in a 12-inch skillet over medium-high heat. Add shallots, garlic and sage and cook, stirring frequently, until tender, about five minutes. Add wine and simmer briskly until reduced by half. Add cream, broth and beets and simmer for 5 to 10 minutes to create a nice, slightly thickened sauce. Crumble in Bleu de Chèvre, reserving a little bit to garnish if you like. Taste for salt, and sprinkle in plenty of pepper. Meanwhile, cook linguine al dente in well-salted water according to package directions. Drain and toss pasta into sauce. You can substitute another blue cheese (like gorgonzola dolce) or fresh goat cheese in this recipe if you like!